With 40-plus wineries (and more on the radar) dotting the map in Southern California’s premier wine country, Temecula Valley welcomes more than two million visitors a year. Not bad for a region that planted its first grapevine in 1968. There’s a reason they come and it’s not just for the award-winning wineries alone. Conveniently located 60-miles from San Diego, Palm Springs and Orange County, and a 90-minute ride from Los Angeles, Temecula makes for a perfect weekend getaway. The area, however, continues to attract more out-of-state and international visitors every year. Steeped in history, home to enterprising entrepreneurs, creative chefs, innovative craft breweries, fun speakeasies and incredible sunny days, it’s no wonder so many come to Temecula. There’s something so refreshing about staying in the heart of wine country and waking up in the vineyards. Sitting amidst picturesque acres of vines and rolling hills, Carter Estate Winery and Resort provides visitors a touch of casual elegance in their Mediterranean-inspired Bungalow Suites. Our stay included complimentary wine-tasting and continental breakfast delivered to our door. Suites are spacious and luxurious and rich linens and soft duvet comforters make your bed exceptionally comfortable. The in-room gas fireplace is perfect for chilly Southern California evenings. A heated pool with private cabanas is ideal for a warm sunny day and al fresco lunch dining is available poolside. Winemakers at Carter Estate utilize the French méthode champenoise process to create their outstanding sparkling wines. A wall showcase filled with award-winning ribbons attests to the quality of these magnificent creations. With picture-perfect weather, Temecula is an excellent golfing destination. Journey at Pechanga is one of Southern California’s premier golf links. Surrounded by rolling hills, this picturesque public course features breathtaking views of the Temecula Valley and Wine Country. 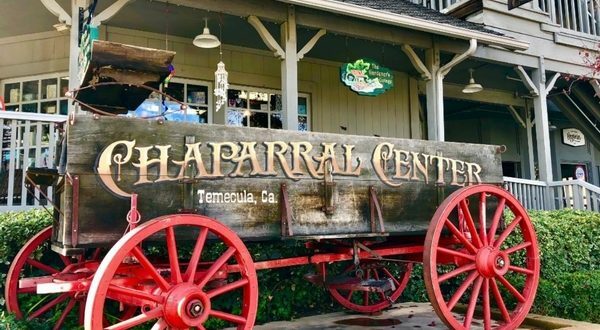 No trip to Temecula is complete without exploring Old Town. Gateway arches at the northern and southern entrances commemorate its colorful history and western architecture. The pedestrian-friendly 12-block neighborhood is festive and lively, filled with remnants of its storied past. More than a dozen properties dating back to the 1890s have been repurposed in a variety of venues along its wooden boardwalks. Antique stores abound, and its myriad of craft shops, charming boutiques and unique mercantiles lure visitors to their welcoming doorsteps. When you’re in the middle of wine country, you drink wine. Some new, creative wineries have joined Temecula’s ranks and they’re well worth the visit. BOTTAIA’s motto is “Italian inspired-locally made.” Their unique approach to the art of winemaking and celebrating life is refreshing. They’ve set the bar on breathtakingly innovative wine-tasting experiences in a variety of spectacularly beautiful settings. Their impressive array of wines can be enjoyed on a raised outdoor terrace, an indoor casual lounge or in a barrel room. Ever thought of blending your own wine in a lab? Here’s where you can do that. When a group of friends who truly love wine had the chance to buy a winery in Temecula, they jumped. Somerset Winery and Vineyard, named after the street many of the long-time friends grew up on, is their collaborative pride and joy. The Hacienda-themed winery, with its massive stone fireplace, is all about the joys of family, friendship, fun and gatherings. They hold a strong belief in the “Let’s make it about people while producing great tasting wines” mentality. And make no mistake, this is very true. French, Italian and Spanish varietals are celebrated with Old World hospitality and charm at Europa Village. Though the winery is certainly not new to the Temecula scene, the pastoral property enhanced by an outdoor European courtyard is like being transported back in time. Wine pourers in the warm enchanting French-bistro inspired C’est La Vie tasting room are engaging and extremely knowledgeable about the winemaking process. With 25 house-made craft brews on tap, Garage Brewing Company is kicking it up a notch with their gutsy and amazing selection of beer. With palate-pleasers like Mango Hefeweizen, Hatch Chile IPA and Marshmallow Milk Stout, every visitor to their taproom is guaranteed an incredible experience. Add in their creative wood-fired pizzas and this is a destination not-to-be-missed. In a historic town, the resurgence of speakeasies just seems natural. Reservations are a must to enter these secret locations. Thompson & Twain Prospecting Co. is literally a “travel back in time.” With décor celebrating the Old Frontier, their libations celebrate the creativity of the mixologists who conjure up offerings like Rattlesnake, Dead Ringer and Snake in the Sand. 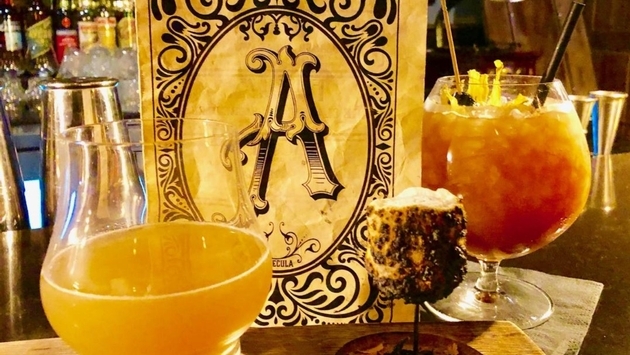 Apparition Room’s claim to fame is taking traditional classic cocktails like the Whiskey Sour and Sidecar and boldly creating new and funky libations that dazzle the taste buds of their patrons. We’re convinced it’s impossible to find anything but a great restaurant in Temecula, given the influx of culinary creativity. Lively artisan restaurant Crush & Brew celebrates the local craft brew movement and wine culture along with some outstanding dishes like their tantalizing Lobster Mac & Cheese and tender flavorful Steak Au Poivre. Our shared Roasted Beet & Burrata salad was a real winner. What started out as a popular food truck morphed into much more and it’s not surprising after tasting the delectable offerings at Devilicious Eatery. Serving unique American bar food with a twist, their Bacon Wrapped Mac and Cheese, California Cheesesteak and famous Butter Poached Lobster Grilled Cheese guarantee patrons will be back for more. There’s a new kid in town called The Nightingale, inspired by an Aesop Fable. Best described as a modern-day Great Gatsby, the charmingly elegant restaurant is a popular community gathering place. Though the menu isn’t extensive, it’s seasonal and well-planned. Homemade pastas like the Short Rib Pappardelle are wowing diners as it certainly did my spouse. Being a huge fan of Cioppino, I decided to give theirs a try and I’m going to just proclaim that it’s the best I’ve ever had—anywhere. We were too full for dessert but our server insisted we try one of their signature desserts–the Salted Caramel Smores Bar. That we even found room to finish it says it all. They say that Temecula attracted the passionate dreamers and driven entrepreneurs. For those of us who visit, we are happy recipients of its incredible wineries, spectacular scenic views and savory cuisine. And to top it all off, who can’t love and respect a place that’s serious about preserving its history?